Louis Noirot was born in Alsace. After an apprenticeship at Guebwiller, in the Brückert lithographer’s studio, he went to Paris to improve his skills, in particular to study chromolithography (a process for obtaining prints of different colors by successive impressions). In 1846 he was hired as as a lithographer by a printer from Roanne and settled permanently in the city. A few years later, he bought the printing house with his brother. Emile Noirot, son of the latter,was first taught by his father. In 1874, he went to Paris to improve his apprenticeship in painting. He was influenced by the Barbizon school, choosing outdoor landscape painting. He returned to Roanne in 1881, and as his grandson Dominique Noirot confided “… he finds with delight and emotion the sites of the Loire Valley, where he stays for long hours, motionless, like a hunter lying in wait for game. He observes, understands and translates the thousand aspects of these austere landscapes … He paints “his river”, … St-Maurice and its dungeon overlooking one of the wildest sites in the valley, punctuated by the remains of an ancient bridge. “(Excerpt from page 26 of the book Émile Noirot published in December 1997 and edited by Galerie Jean-Pierre Prebet). Noirot’s work is immense and varied, nourished by his trips both in France and in Italy. 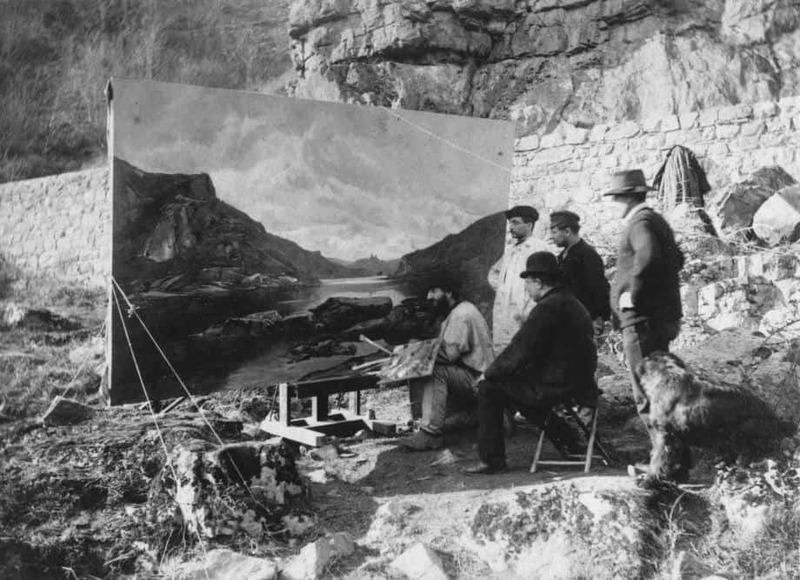 However, the painter has always remained attached to the Roanne region and the Gorges de la Loire, which he chose to represent on monumental paintings made for the city of Roanne and the Prefecture of the Loire. We can also note that the paintings selected by the Paris juries were on the same theme: in 1889, as part of the Universal exhibition, Le rocher de la Madone (near the Saut du Perron) received an honorable mention ; in 1893, Le Saut du Perron represented France at the Universal Exhibition in Chicago, and the same year Lever de lune à St-Maurice was awarded the second class medal at the Salon (highest reward since during this Salon in 1893, the first class medal was not awarded).